“Too Big to Fail Banks” (TBTF) has a nice ring to it if you are a banker, but many struggling citizens are demanding tougher regulations on the members of the Federal Reserve System (FED). The United States is considering increasing the surcharge for being part of the FED. Some of this mirrors public anger over the High Street banks of London and the Occupy Movement against Wall Street banks of New York. In September 2014, FED Governor Daniel Tarullo announced that central banks were contemplating charging higher rates for member banks. This is occurring in an environment with the following characteristics: record bank profits, concerns over taxpayer bailout funds, admitted financial fraud, and economic turmoil. The banks have become a popular target for outrage. Let us start with the Federal Reserve System. Most people don’t realize that this is a private organization, and it is not a member of the United States government. Yet, it has been given control over issuing the Federal Reserve Note (also known as the United States Dollar). If that wasn’t enough of a conflict of interest, when the Federal Reserve member banks ran into financial problems, they received a bailout from the US taxpayers. This act increased the level of congressional oversight and scrutiny. After the bailout, these banks enjoyed record profits. Now, the top six (6) American banks control nearly 60 percent of the gross domestic product of the United States, leading to monopoly concerns. Major League Baseball has a luxury tax on the teams with the largest salaries. The Federal Reserve is considering a similar proposition. Tarullo told the Senate Banking Committee: “We’re all trying to come to grips with what we really need in order to provide more assurance that these firms (top banks) do not threaten the financial system …” Analysts are lamenting that the same problems in 2008 that nearly led to the meltdown of the entire global banking system remain in 2014. 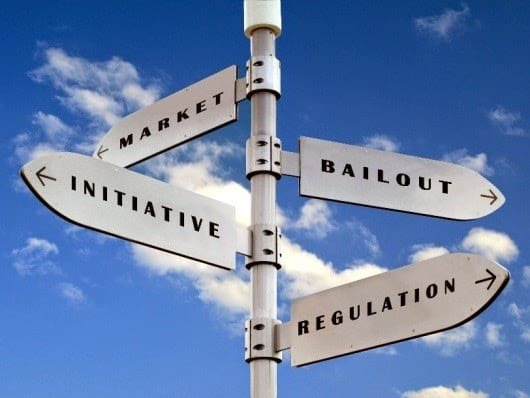 Global regulators have listed 29 banks (including eight in the United States) whose failure could lead to serious macroeconomic distress in the worldwide economy. For example, JP Morgan Chase Manhattan (JPM) may be forced to increase its capital requirements by 2.5 percent of its assets. Many fear that the balance sheets of the top banks remain woefully under-capitalized. The top banks had the biggest surcharge to avoid a repeat of TBTF bailouts. As regulators continue to target banks, access to small business and working capital loans are sure to suffer as a result. Capstone Capital Group, LLC understands these concerns and offers various business finance options, including Purchase order factoring, “Single-Invoice Factoring,” which functions as a safer alternative to traditional, and oftentimes unpredictable, bank financing. Our underwriting guidelines are simple, straightforward, and not subject to stringent regulatory oversight and control. Capstone Capital Group, LLC specializes in Single-Invoice Factoring (“Spot Factoring”) for firms in need of immediate cash. Spot Factoring provides flexible, no-contract invoice selling in exchange for working capital from Capstone. Give us a call today to find out how we can help you.